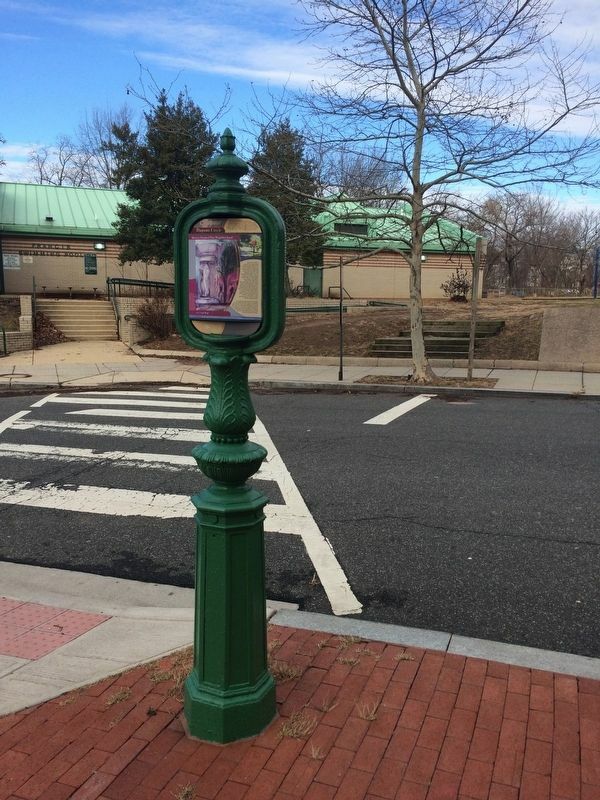 Police Call Boxes such as this one (originally painted blue) were installed in the District after the Civil War. Officers on foot patrol used this secure telegraph system to contact the station, accessing the box with a now highly collectible "gold key." This system was used until the late 1970s when it was abandoned in favor of more modern communication methods. 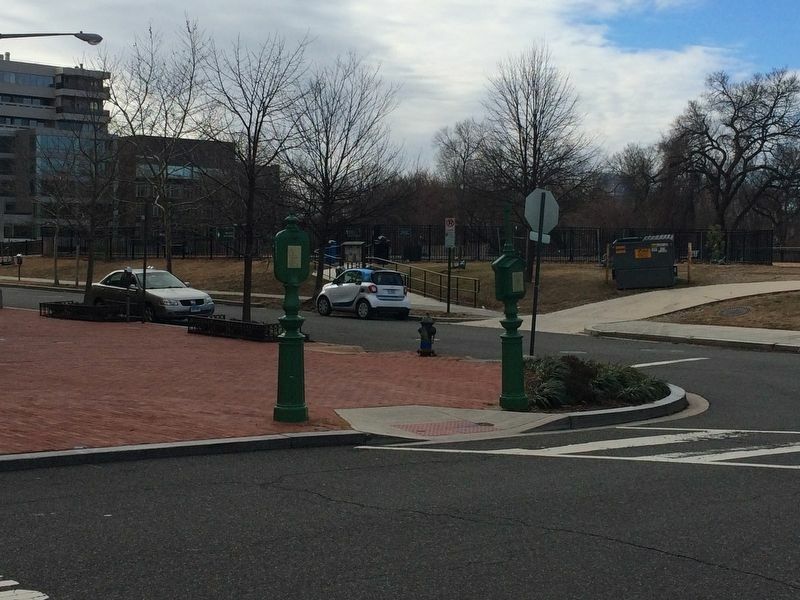 Mall to the National Zoo. Not content with helping save Rock Creek Park, Glover assembled more than 3,200 acres of parkland that he felt were crucial to the integrity of the city and made a gift of it to the District of Columbia. He said he was inspired to do this by the creation of Yellowstone National Park in 1870. Today Glover is considered the father of the National Zoo of Rock Creek Park, and of Rock Creek Parkway. Born in Iran, Ms. Majd lives in Dupont. A graduate of the Corcoran School of Art, she exhibits extensively in DC, and focuses on oils, acrylics, bold color balances, human forms and the total immersion experience offered by installation art. Location. 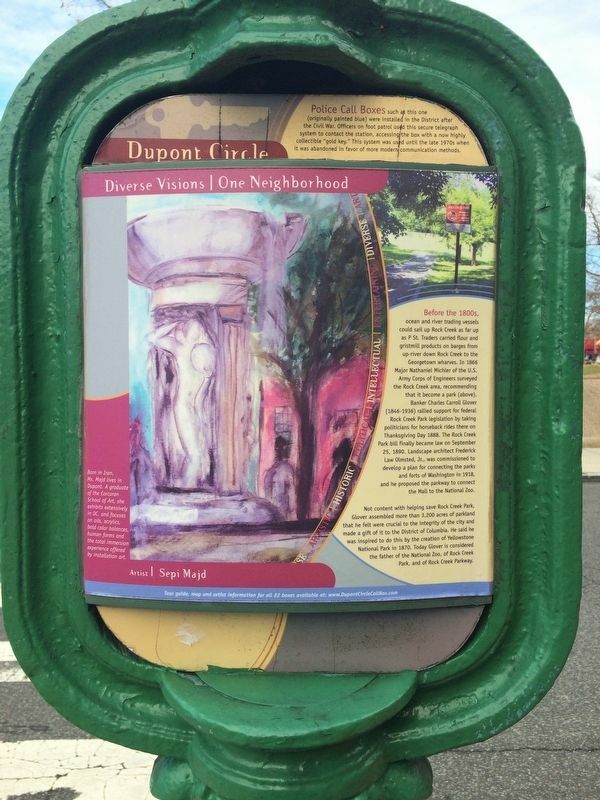 38° 54.429′ N, 77° 3.193′ W. Marker is in Dupont Circle, District of Columbia, in Washington. Marker is at the intersection of N Street Northwest and 25th Street Northwest, on the left when traveling west on N Street Northwest. Touch for map. 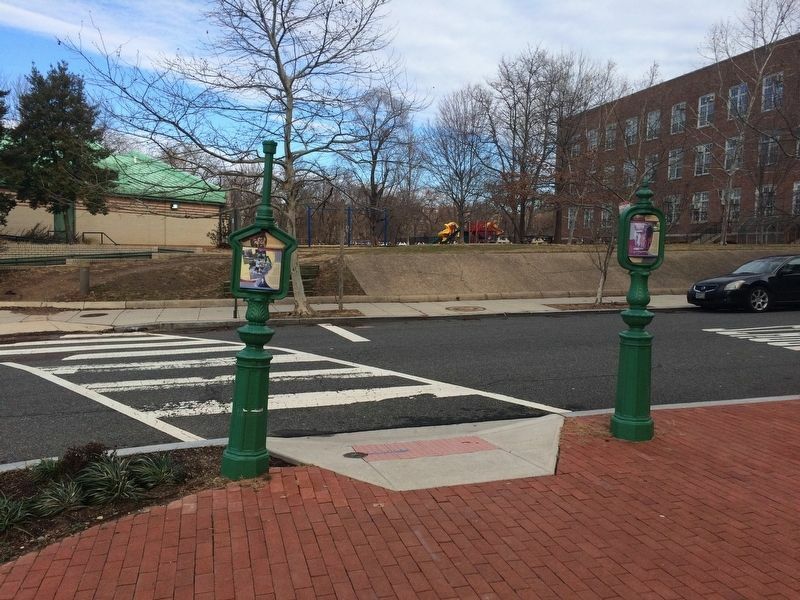 Marker is at or near this postal address: 1275 25th Street Northwest, Washington DC 20037, United States of America. Touch for directions. to this marker); Rose Park Recreation Center (about 600 feet away, measured in a direct line); Margaret Peters and Roumania Peters Walker (about 700 feet away); First Baptist Church, Georgetown (about 700 feet away); Epiphany Catholic Church (approx. 0.2 miles away); Herring Hill (approx. 0.2 miles away); Washington Before Washington (approx. 0.2 miles away); Signing of the Rush-Bagot Agreement (approx. ¼ mile away). More. Search the internet for Before the 1800s. Credits. This page was last revised on March 22, 2019. This page originally submitted on January 14, 2018, by Devry Becker Jones of Washington, District of Columbia. This page has been viewed 76 times since then and 9 times this year. Photos: 1, 2, 3, 4. submitted on January 14, 2018, by Devry Becker Jones of Washington, District of Columbia. • Bill Pfingsten was the editor who published this page.